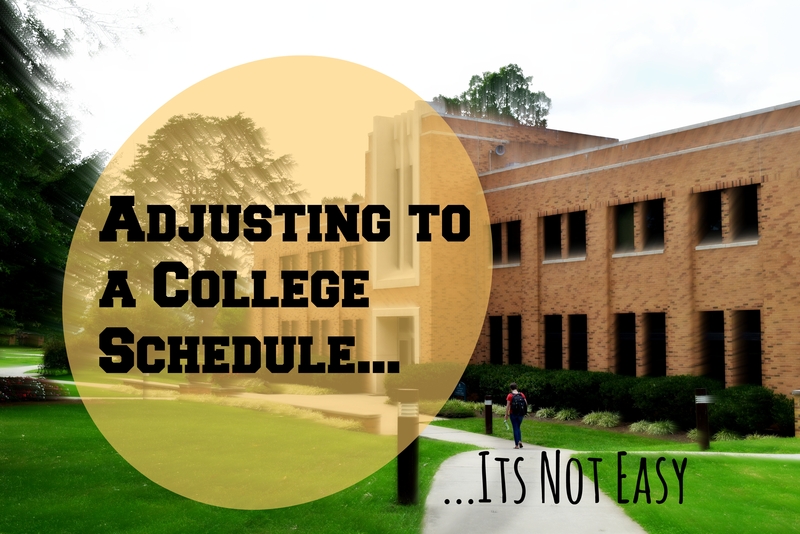 Adjusting to a college schedule is something I am in the process of learning. College life is so different than, well, any other kind of life. And I’ve discovered that at college your daily life and schedule are packed full. Every student I’ve met seems to be in the same boat! Week days are spent in class and studying for your next class, and weekends are filled with homework and and fun with friends. But needless to say, I’ve found that in college I have something going on nearly every hour of every day. You’ll hear professors and parents talk about syllabus shock, but I think just schedule shock in general is a very real thing. But in the few weeks that I’ve been here I’ve learned a few things that I think help. When we were toddlers our favorite word was “no!”. Somehow as we grew older it seemed to have slipped our of our vocabulary. Well I challenge you as a college student to say no! I know there are a billion super-fun activities to do on campus. (I hear Bryan now has a Once Upon a Time club. Sign me up!) But you can’t do everything. Taking 19 hours of classes and joining four clubs is simply not a good idea. Pick and choose what you want to do. That way you’ll have more time to devote to the stuff you truly enjoy! Schoolwork is stressful. It just is. I’ve found that one of the best ways to relieve my stress about school is to plan everything out. Everything. For me it really helps to just write everything down. That way I will at least know that I won’t forget about that important assignment that’s due on Wednesday. Planning when I have assignments due and when I should work on them (and keeping to that schedule!) really helps me. And this kind of goes right along with that: don’t procrastinate! You will be a much happier and a more stress free person if you get your work done ahead of time. No one wants to have to stay up until 4a.m. working on a paper you put off all week. So plan it out! College is hard. Don’t feel bad about yourself if you feel like you can’t do it. Most of the other freshman are having the same thought right about now. The newness and excitement has worn off and you’re realizing that you have three tests next week. Its okay to be a little upset about it. You’re not the only one! Cut yourself a little slack. As long as you’re putting one foot in front of the other you are doing good. As my mom likes to say, just do the next thing. Try to live in the here and now, and don’t think about the entire semester. And when you’re feeling really stressed just take a break. I like to watch Doctor Who. And I’m hoping that with a little trial and error, I’ll learn to manage my busy life at college. I hope you can too! Great Tips Karis! 😀 Have you seen the latest episode of Dr Who? Hey Evie! 😀 Yes! I did see the new episode! I’m so glad its back on tv. Hurray for Doctor Who! And, I know right! This whole college/university thing will really sneak up on you. But you can totally do it!